The first coil-wound pickup was designed and used by Lloyd Loar on a solid-body viola in the 1920s. Not long after, electric guitars were invented during the 1930s out of the necessity to be heard with the loud brass orchestras of the Big Band Era. In 1931, the Electro String Company, now the Rickenbacker International Corporation, produced the "Frying Pan," a cast aluminum electric guitar. Several years later, the Gibson guitar company produced the first hollow-body electric guitar, the ES-150 model. In 1951, Leo Fender introduced the first mass-produced solid-body electric guitar, originally called a Broadcaster. However, Gretsch produced a line of Broadkaster drums, which forced Fender to change the name of its new guitar, resulting in the Fender "Telecaster." With the further release of the Fender Precision Bass and the Fender Stratocaster, electric guitars gained popularity and continue to be high in demand by today's musicians. Had electric guitar music emerged from transistors, would we even recognize it today? Premier Guitar. Tuesday, 23 Apr 2019 07:00:00 -0400. Does an Electric Guitar's Paint Really Affect How It Sounds? We asked Fender about the science of guitar paint and sound, and found that maybe the Smashing Pumpkins' Billy Corgan was onto something when he claimed paint color affects tone. Yahoo. Tuesday, 05 Mar 2019 09:42:00 -0500. 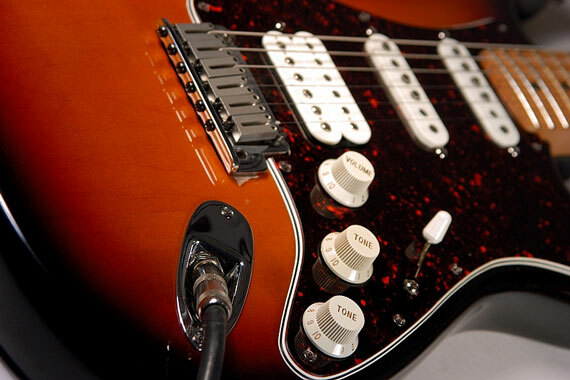 Before buying an electric guitar, decide what kind of bridge and pickups you prefer. An electric guitar comes with a fixed bridge, a fulcrum bridge, or a floating bridge. As the name of the fixed variety indicates, this bridge is immovable and tends to stay in tune well. The latter two bridge varieties have a tremolo bar, which allows for interesting effects. However, the fulcrum bridge tends to cause the guitar to go out of tune, and the floating bridge is difficult to tune initially, as the position of the bridge depends on the tension of the six guitar strings. Pickups come in two main varieties: single-coil pickups and dual-coil pickups (humbuckers). Single-coil pickups produce a brighter, clearer tone and have been around longer, but they often pick up hums or buzzes from lights, computers, or nearby electronic devices. A humbucker is basically a pair of single-coil pickups placed side by side and wired with opposite polarities. This setup causes the guitar pickup to "buck" the "hum," as extraneous sounds register on both pickups with equal amplitude, thus canceling themselves out. Humbuckers produce a rounder, fuller tone than single-coil pickups. A close-up photograph of a solid body, six-string guitar focuses on the sound pickups. Turn the top knob to control the volume, and the bottom two knobs to control the tone. Create the unique sound you desire simply by manipulating these pickup controls. Some guitars employ both pickup varieties and depend on the pickup selector switch to toggle between the various pickups. Before you buy an electric guitar, plug the guitar into an amplifier, play a few songs, and test out the volume and tone controls and the pickups via the pickup selector switch. Keep in mind that the scale length, the distance between the nut and the saddle, will affect the ease of bending strings. Avoid guitars that produce static, buzzing, or crackling noises. This electric guitar company offers the Epiphone and Kramer Brands, as well as a range of custom, art, and historic guitars. Fender is a manufacturer of well-known Telecaster and Stratocaster guitars. Benedetto is a producer of jazz guitars. The tagline for Charvel Guitars is "The Original Hot Rod Guitar". Founded in 1883, this company produces guitars with "That Great Gretsch Sound". Guild is a Fender company offering several electric models. Squier is a line of affordable electric guitars by Fender. Rickenbacker's history reveals that their guitars were owned and played by several Beatles. Yamaha offers several series of electric guitars, including silent guitars, hollow bodies, and their signature series. Peavey offers a broad range of musical equipment, including electric guitars and guitar amplifiers. This Canadian company offers electric guitar parts and several innovative series of guitars. Founded in 1946, Carvin specializes in building and selling quality musical instruments. 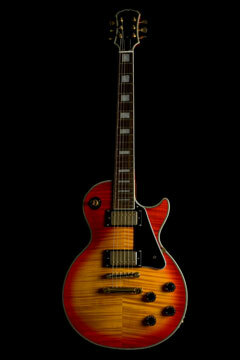 ESP is a Japanese electric guitar company offering hand-built custom guitars and the LTD brand. Paul Reed Smith offers a combination of machinery and human craftsmanship that contributes to the quality of PRS guitars. Anderson is a small American company that creates electric guitars with quality feel, play, and sound. "If it feels right, I know it will sell" – Ernie Ball, music man. Knowledge and research contribute to the sound of these wood guitars from Ken Parker. "Playing is believing". Jay Turser offers musical instruments, equipment, and accessories. 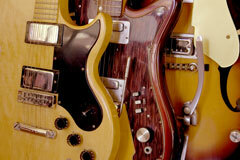 TV Jones offers hand-made electric guitars catering to the jazz, country, and rock music styles. This Michigan-based guitar maker was incorporated in 1985. Its products include solid body, semi-solid body, and hollow body electric guitars. Bass Guitars - four-string electric and acoustic guitars. Guitar Amplifiers - solid-state and tube-type guitar amps.